Today we’re going to visit Komagata Dojo, just a five-minute walk south from Sensouji’s Kaminarimon. 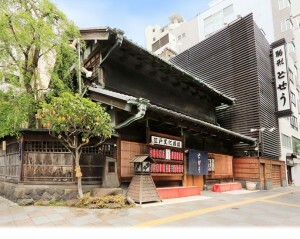 Established in 1801, this is a loach restaurant that has been patronized for over 200 years since the Edo Period. The building looks so amazing! It’s wonderful. This is a typical merchant-house construction style of the Edo period. The building was purposefully built with no windows on the second floor so that commoners wouldn’t be able to look down on feudal lords and other aristocrats traveling on the road in front of the house. Watanabe: Hello. I’m Takashi Watanabe, the 7th generation owner of Komagata Dojo. Come on in. 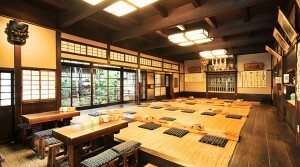 Wow, the first floor is a large Japanese-style seating area. You can hear the customers enjoying themselves and the restaurant staff calling out, along with the smell of food and drink. It’s a great atmosphere! It’s like going back in time to the Edo period. Watanabe: Asakusa was destroyed by fire over and over, in the great fire of Edo, the Great Kanto Earthquake in 1923, and again during WWII, so even though this is a post-war building, but we wanted people to enjoy the flavors that commoners of the Edo period did, as well as its atmosphere. In this location, a large building would have accommodated a lot more customers, but the owners of the restaurant have handed down strong traditions from generation to generation. And so even today, you can enjoy an experience available nowhere else. Are those long boards in the seating area used for tables? Yes, we put food on them. They’re called kana-ita (metal boards) because they used to have copper panels on top until the pre-war. Now the copper panels are gone, but we still call them kana-ita. Well, let’s go ahead and order the specialty loach nabe and loach soup. This is an unusual small and shallow cast iron pot, and it’s filled with loach. What a sight! Watanabe: Because the pot is shallow, it boils quickly. You’ll know it’s finished when it starts boiling a little. Top it with plenty of spring onion before you eat it. Delicious. There’s no smell, and the bones are so soft. Why is that? Watanabe: It’s because the loach are prepared in advance. 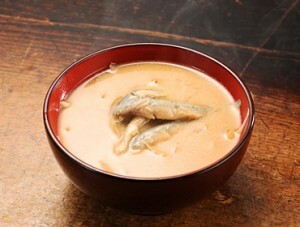 We put a live loach in alcohol to intoxicate it, and then we boil it in miso soup. Then we arrange the loaches in the pot and have the customer eat while boiling them in broth. So, a lot of work goes into it. Watanabe: The miso soup we use to prepare them in is Edo miso, from a fellow Toto Norenkai member, Chikuma Miso. It contains a higher proportion of koji, so it’s not as salty as regular miso. The loach soup is delicious too. It tastes really great with rice. Watanabe: Loach were kind of like the fast food of the Edo period. When farmers came to Edo with their vegetables harvested in the morning, first they had loach soup for breakfast. After selling their vegetables and before heading home, they’d come again for loach nabe. If they had some pocket change, they might also order a bottle of sake. That’s quite an image! To be honest, I never imagined loach would taste this delicious, but now I understand the reason why both Edo people and modern day people love it. The restaurant is full of customers today. How many loach are eaten here every day? Watanabe: Fifty to sixty kilograms, so that’s around 40,000 fish, more on holidays. Let’s try the whale nabe and the catfish nabe next. 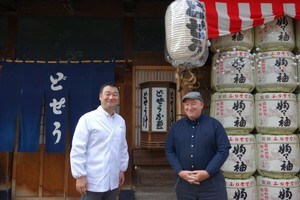 Watanabe: The whale dish is one of our well known dishes. It was introduced by the second generation owner who thought, Loach is the smallest fish, so let’s try selling the largest fish. 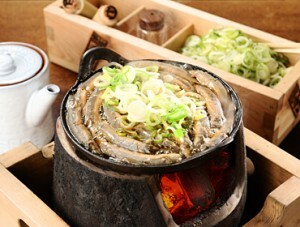 The whale nabe has whale blubber boiled with burdock root. Add seven-spice blend as you like. 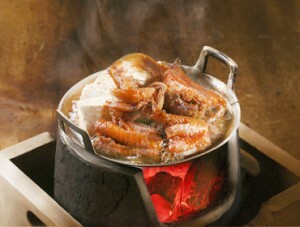 The catfish nabe has fresh catfish boiled thoroughly in a salty-sweet soy sauce broth. When the tofu is boiled, add a dash of sansho pepper and eat it. Both the seven-spice blend and the sansho pepper are from the Toto Norenkai’s Yagenbori Nakajima Shoten. Both of them are delicious! It’s really a good idea to pair the whale with burdock root and the catfish with tofu too. The food here is wonderful of course, but the building and interior, and all the staff are so lively and wonderful too. Watanabe: Thank you. I’d like this restaurant to be a place where the customers eat until they’re full and go home happy. So, once a month, we do things like inviting people from various fields to give the staff a lecture. Watanabe: For example, we might learn why it’s proper to place chopsticks pointing to the left. That’s interesting. So the staff here can learn about the culture, and not just how to take care of customer. What kind of things have you studied? Watanabe: From elementary school to university, I went to a single school organization, so I didn’t experience entrance exams and I didn’t study much either. But after that, I went to a university in Maine in the US for two years and studied psychology, math and business management. Did you have a good experience there? Watanabe: Yes, I learned how to studyーstudying before a class, asking questions and then making sure you understood, simple things like that. Yes, that’s important in itself. So before we finish up, as the seventh-generation owner, let us know what you are thinking about for the future. Watanabe: I want to make the room of chair seats on the second floor have more of a Meiji period atmosphere, so we’re moving forward with that. I think it would be great if guests could experience the Edo period on the first floor and the Meiji period on the second floor. We have a storehouse next to the building, so I’m thinking about how to use that. I want more people to try loach, so we’re working on a mail-order system. It’s clear that your strong passion comes through in the way you operate the restaurant. Thank you for giving us a taste of the Edo period. It was delicious!